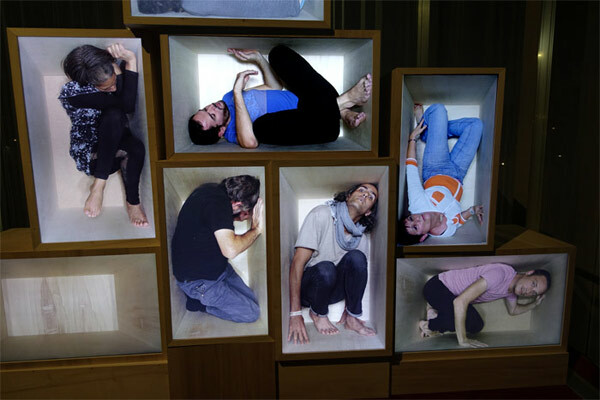 In FRAMES, bodies, more or less curled up, are displayed (at scale 1) in a pyramid of boxes. 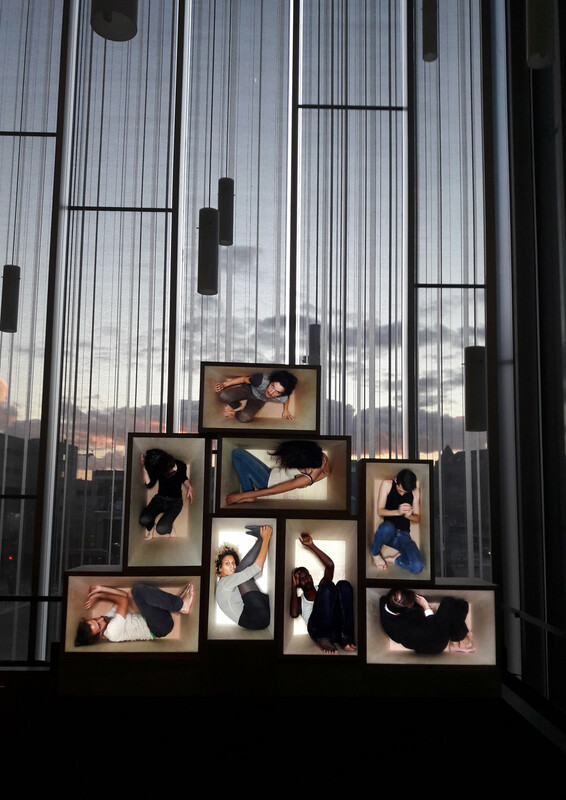 They move as best they can in these restricted spaces interpreting a common partition (in real time, using randomness), where time is stretched, where the gestures produced abandon themselves in a general choreography to become others. Thus, the method of playing videos modifies the initial individual gestures to produce new patterns. The first semantics of the gesture are finally destined to an infinity of possibilities. 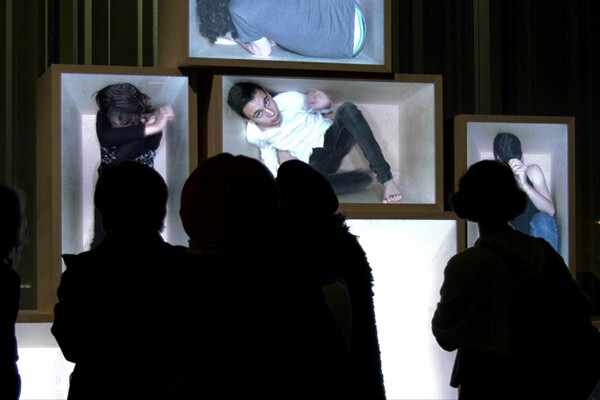 "Frames, polysemous term which means both "frames", "images" of a filmed sequence or "silhouette", is a video work presenting individuals curled up and constrained by the size of the boxes within which they evolve. 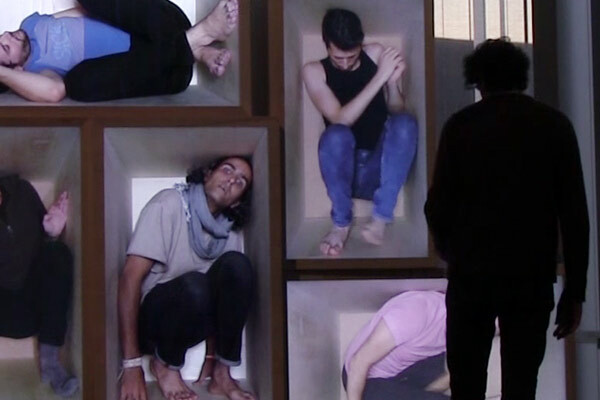 The boxes, eight boxes of wood assembled vertically and horizontally to form a pyramid, contain a body, at the same time isolated and connected to others by its condition. Taken individually the body interprets its own score of gestures, considered within a set, it participates in a kind of choreographed piece. Nicolas Clauss films inhabitants of Le Mans, in the dress code of their choice. They are neither professionals of the dance nor the theater. The artist concentrates all his attention on the movements produced, not defined beforehand, although oriented by confinement. If they are to be executed as naturally as possible in a somewhat exceptional situation, it is a posteriori that the artifice intervenes, based on experiments on the filmed image. Movements of the body, now reified, are diverted and manipulated to be slowed or split, then repeated: oscillatory movement of an arm, a foot, a pelvis, from left to right, from right to left. Elbow-hand-hand-elbow, foot, foot, foot, body abuts, insists, starts again. As if connected to invisible electrodes that would send electrical stimulations, the limbs perform jolts. The result is a feeling of strangeness that sound creation, produced synchronously played, reinforces. To move in a box, what for? Frames becomes a new projection of the interrogations that Nicolas Clauss has been going through for many years to believe his training in social psychology and his previous achievements. In what ways does our individuality express itself? How is our behavior influenced by the group? What are the human interactions at stake? What behaviors do they generate? Sometimes the matrix (the group, the box, etc.) envelops, sometimes it absorbs. The corpus of works by the artist is nourished and enriched by recurrence. From a constituted group, the artist extracts a body and by different processes, manipulates it, breaks it down, accentuates, emphasizes or repeats its actions, to give it a new state. The image is stretched, dilated, the camera zooms and unzooms, the bodies operate vibratory movements, the gaze the objective (and by the rebound effect, the observer). Body of the individual and social body. Choral bodies. The crowd is abstracted, the being, in its singularity, becomes subject of representation. Painter repented, Nicolas Clauss attaches to the composition. Frames (the periphery of the boxes) line each of the moving "portraits" or the empty boxes. The frame signifies the limit and isolates the subject from any temporal and environmental context; it marks a break, denies off-camera, and is a metaphor for social and behavioral patterns. The whole forms a polyptych which is observed at a distance, in its totality, and in sequences, by fixing the attention on a particular screen. If Frames writing is precise, the implementation protocol set and digital tools perfectly mastered, once started the installation responds to a random program generating infinite combinations. Random mode is considered both as a work tool and as a formal language. It engages no narration and allows a permanent renewal of what is played, without beginning or end. Open, constantly renewed, Frames let the unexpected through." C.H. The piece gathers 8 wooden boxes, each containing a screen. Each screen is connected to its own computer and can broadcast 4 separate bodies (32 people were filmed). The 8 computers are themselves connected to a master computer that executes the visual and sound partition. The work is played in real time and is constantly renewed. Regularly one body disappears to make way for another. The boxes can also be emptied of their contents leaving the image to an empty box. These compositional rules leave room for multiple combinations... as many tableaus as possible. FRAMES was coproduced by Les Quinconces - L'espal, national scene of Le Mans with the support of DICAM.